I'm not as despondent about it all as perhaps the blog post sounded. 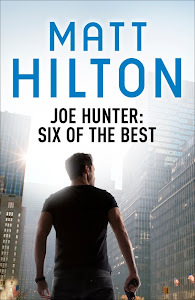 I happened to host a rather long and heated debate on my Facebook page after some of my readers were complaining they couldn't get hold of the latest Joe Hunter book and what I found out about it's distribution wasn't too great. I was obviously disappointed at the time, but I'm OK now, and as enthusiastic and optimistic about my career as ever. Based upon the somewhat controversial topic raised on Facebook, and the mixed emotions and opinions batted back and forward, Tony asked me if I'd write a guest piece at Pulp Pusher, and maybe I pitched it a little too one-sided in hindsight. Maybe not too surprisingly it kind of divided opinions - even though I did say I was playing devil's advocate, and my intention was to champion all authors, and not necessarily have a go at the bookshop chains. Maybe using my own examples came across as if I was whining, but it's too late to change that now. But, yeah, I guess I still stand by the fact that through current ordering protocols we're being shafted and that current practices could kill some writers' careers before they get started. But I could as easily tell as many good news stories as bad, and - for me - it's still the best job in the world. Opportunities still exist for authors, whatever route you choose to follow. As someone mentions, it's not books readers seek, but stories, and we're all story tellers. It might just be that the form in which people gather those stories to themselves might be different than this 'old timer' has grown accustomed to. I'm still a fence sitter when it comes to what's the right and wrong direction to take (self-pub versus traditional publishing) - and again am not going to get into any argument one way or the other, because I simply do not know what the answer is. As it happens, I'm traditionally published, and more than thankful for that. My traditional publishers also put the books out in ebook format, so I'm probably doubly represented and therefore doubly grateful. If readers can't find my books on the shelves, they can still find them online. Use that as inspiration if you will - if I can do it, then so can you. Don't let my momentary knee-wobble put you off writing and following your dream. I'm over it. Keep on keeping on, as a wiser man than me once said. I'm with you on the fence sitting. I actually tend to think that's the best place to be...on the fence. You can go either direction at anytime and in business, flexibility is often very important. Times may be changing but burning bridges is rarely the right thing to do. I took your original post for what it was: honestly making people aware of the shoddiness and greed within the industry, much to the detriment of the 'not so famous' authors. However, it is nice to hear there's a flipside to that coin, whereby we can take back control. I never took that post as a "woe is me" experience. I took it as an informed opinion on the challenges facing midlist authors. Us apspirers need to know that kind of stuff and I for one am grateful for you to giving voice to your expert opinion. I'm undeterred and plan to start seriously looking for a trad publication deal later this year. I'm still looking at a trad publisher this year, not dissuaded at all. What I got out of your post and the FB discussion was that you had connected with your fans and that was showing up the big-box ordering and stocking system to be lacking. This is also why having the publisher push, the author brand and the appeal to real book stores (independents and the like that are there for readers, not the 1 book a year crowd) is very important. I think it also shows that authors need to pimp each other's books. "Like my book? Well, I really enjoyed X."